The Denman is the perfect wedding venue when seeking a fabulous weekend getaway with your guests. The Terrace Restaurant, framing the mountain landscape with its floor to ceiling windows is ideal for hosting groups of up to 120 guests. Choose from a variety of menu and canapé selections; our Chefs will create sumptuous food for your special day. The Apres bar is the perfect location for some pre-reception drinks and canapes or a post-reception party. 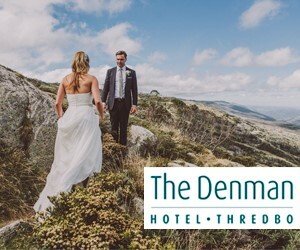 Our staff not only assist with making an alpine wedding perfect in every way but will also provide your guests with all of the information they will need to book their trip to Thredbo.